It was time once again to break out the flaming atomic birthday candles…all 56 of them! Godzilla, everyone’s favorite giant city stomping Japanese monster turned 56 years old (he didn’t look a day over 35) on November 3rd and a fitting celebration was held in the Ginza area of Tokyo. The entire Japanese Self Defense Force and vast brigades of Fire Trucks were standing by for the party to begin! Ginza Cinepatos Theater was the site of this five day action packed event that kicked off with a Saturday evening showing of one of the best Heisei series Godzilla romps “Godzilla vs. Biollante!” This exciting 1989 Toho Co. film was written and directed by Kazuki Omori with Kouichi Kawakita at the helm for Special Effects. 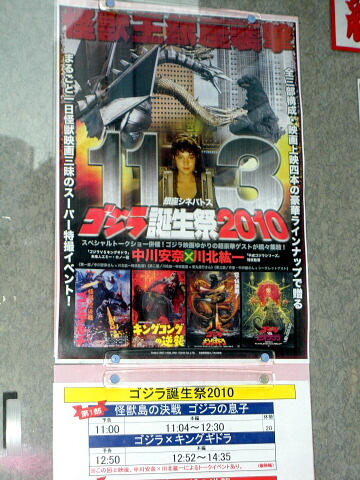 Although Toho Sci-Fi films were shown from October 30th through November 5th, the real “Monster Party” began on the BIG day, Wednesday November 3rd. 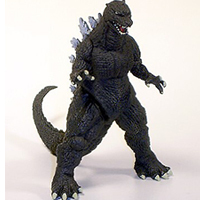 The original Godzilla movie premiered in theaters all over Japan on November 3, 1954. A large expectant crowd of Godzilla fans (young and old) lined up for the 11am screening of the fun filled Godzilla Shows classic “Son of Godzilla” which of course features everyone’s favorite smoke ring blowing enfant Kaiju Minya. The print was excellent, and it is always a treat to see Minya, Kumanga, Kamikirus and Godzilla on the big screen. Following this fun filled frolic the crowd moved into the lobby where many movie props and posters were on display. People also had a chance to buy a copy of Kouichi Kawakita’s latest book “Tokosatsu the age of Godzilla & Toho SPFX”.” Satoshi Nakamura from Cast Co. was one of the people responsible for this wonderful party and he and his friendly staff were selling special posters (Heisei Godzilla collage featuring “Burning Godzilla” and a War of the Gargantuas poster collage featuring the Japanese Ground Self Defense Force Operation L Super weapons) as well as the latest Cast Co. Dioramas! Since they were Showing “Godzilla vs. Biollante” as part of this weeklong celebration, Cast Co. had produced a new beautiful Diorama of the “Rose Biollante!” Excitement was in the air and the lucky Godzilla fans (including us “Clawmarkeans” ) were taking advantage of this wonderful chance to get their claws on these new Cast Co. offerings. After the intermission, the second feature (this one from the Heisei series) was the 1991 film Godzilla vs. King Ghidorah. The print of this film was just beautiful and it was really nice to sit back and enjoy this action packed film which is considered by many to be the most controversial Godzilla film ever made. The controversy centers around the theme of Godzillasaurus saving a group of Japanese soldiers from an American army’s island invasion. When the Americans attacked, Godzillasaurus attacked and killed all the Americans, allowing the Japanese soldiers to survive. Included in this sequence set on a US Navy ship off shore, was the scene when the captain of the ship and another officer saw the time traveling “Futerians” space ship zoom by overhead. After discussing what they believed to be a UFO both had just seen the captain spoke the lines “someday you can tell your children about this Major Spielberg” which of course was a nod to the block buster “ET” directed by “Major” Spielberg’s son Steven Spielberg. Funny, I did not even know they had the rank of Major in the American Navy! After much applause following the conclusion of this awesome film, a lively discussion panel took place. On hand for this interesting birthday chat was the famous Kouichi Kawakita, (Godzilla vs. King Ghidorah special effects director) a well as the lovely Anna Nakagawa (who played the lead role of the captivating “Futureian” Emmy Kano) featured in the movie. 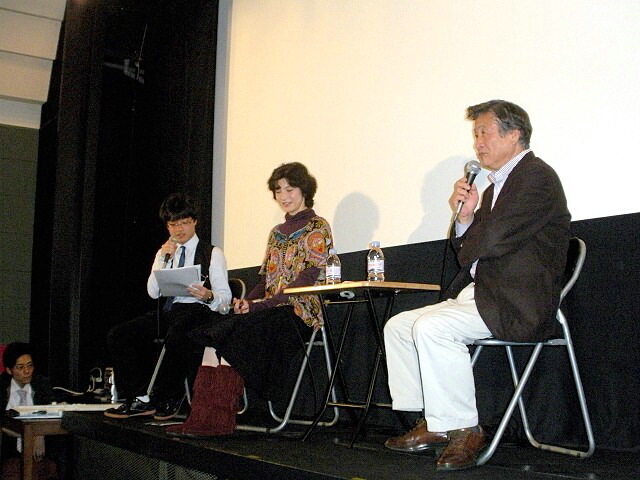 The moderator of the panel was the young and promising screen play writer Takeshi Maruyama. Anna Nakagawa was gracious and happy to recall the excitement of her roll in the film. She spoke of the fun she had filming her “operating” MechaKing Ghidorah as well as some of the difficulties using the special effects “wire work” required when she as Emmy was supposed to be flying using the jet powered personal back pack flying unit. Satoshi Nakamura (owner of Cast Co. and a big Kaiju fan and collector)handed her a couple of the props from the film including the “Dorat electronic “whistle” she used to call the little creatures and the well worn Godzilla book the Futureans brought back in time to tell of the “Danger of Godzilla.” Anna also spoke about her fondness of the “Dorats” and how they were made to operate while sitting on her shoulders. Following the panel was a well organized autograph session for all the eager fans to get their Godzilla vs. King Ghidorah goodies signed. Also, as an extra birthday treat, Cast Co. had produced a special set of “Bromide” cards (available for purchase prior to the signing) showing action scenes from the movie as well as publicity shots of Anna Nakagawa. We had brought a great photo of Emmy Kano with the loveable Dorats for Anna to sign. Next came a short break which allowed more time for the fans to check out the various props, photos and posters on display as well as picking up a copy of Kawakita’s latest book. Speaking of Kouichi Kawakita’s new book,at 5pm everyone was treated to another birthday surprise with a “Talk Show” hosted by Cast Companies Satoshi Nakamura. Kawakita-san spoke with obvious pride about his latest tokusatsu (special effects) book. We were lucky enough to get our little claws on some copies of this wonderful book. It has some really amazingly rare photos taken at Toho Studios during the filming of the many Kaiju and Sci-Fi movies over the years. The hot rumor that had been running through the Tokyo Godzilla Fan community was that there would be a “very special guest” that would grace the Talk Show stage. We were not too sure who would walk out, but we were really surprised when Kaiju Master Suit Maker Yasu Maru joined the panel. A lively discussion took place as Maru-san answered questions about all the work that went into making the suit for Mechani Kong and GOROSAURUS! Maru-san also spoke about his work making the suits for the Space Monsters from the Hunter Nebula, Gigan and Megalon. Part way through this informative Talk Show we felt the room start to shake and we thought for sure Godzilla himself arrived, but darn it, it was only a passing train! Following the Monster Talk Show, everyone lined up with great anticipation for a chance to get Kawakita to sign copies of his interesting new book. After schmoosing for a while with a couple of the Japanese fans, we found ourselves at the very end of a rather long line to get Kawakita-san to sign our few copies of his new book. While in line we took the opportunity to speak with young screenwriter Takeshi Maruyama about his interest in Kaiju Movies. He said he really enjoyed many of the Giant Kaiju, and he had a soft spot in his heart for Space Godzilla, but his favorite was still Godzilla! 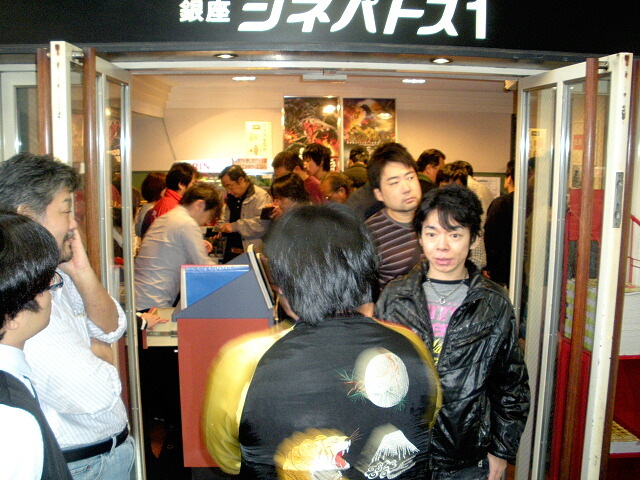 We finally got through the line and although Kawakita’s hand was getting tired, he still smiled and seemed to get a kick at seeing some familiar “Gaijin” Fans. Of course he has seen us in Chicago at G fest and at the Hollywood G Fest as well as at many Kaiju events in and around Tokyo, but he still gave us a big smile. Going back into the darkened theater, we were just able to sit down in time to see the opening credits for King Kong Escapes. The print quality was a little disappointing, somewhat faded and scratched, but aside from that we always enjoy seeing this action packed 1967 Toho Kaiju movie on the big screen. The special effects for this film were supervised by the one and only Eiji Tsuburaya. The cast of cadaverous Eisei Amamoto as the sinister and evil Dr. Hu, Roads Reason as the dashing and brave Commander Nelson, Mie Hama as shapely shape shifter Madam Piranha, Linda Miller as the “Perky” young Lt. Watson (“Kong, Kong, put me down Kong!”) and handsome, strong, but not too silent Akira Takarada as Lt. Commander Nomura were all given a good script to work with and many unforgettable scenes. It always amazes me how calmly Dr. Hu shoots the “Old Man of Mond Island” (a very animated and vocal Ikio Sawamura). Of course watching King Kong (played by Haruo Nakajima “Mr. Godzilla” himself), and both Mechani Kong and Gorosaurus (played by Yu Sekias) fight it out is still thrilling after all these years. As anyone who has ever seen this film knows it has loads of “Monster Action” to spare. Diane and I really enjoyed seeing Gorosaurus, Mechani Kong and King Kong strut their stuff on the big screen once again. The last movie of the night was one of the most talked about Heisei Godzilla films, Godzilla vs. Biollante! The print was excellent! The film has excitement galore with a strong cast, a strong script and wonderful special effects. We have always loved Biollante (Diane is a vegetarian) and no matter if he was a rose when he was young or not, the battle between Godzilla and Biollante is one of the best Kaiju battles to date! Watching Godzilla vs. Biollante was truly a fitting end to this Monster Birthday Party for the best loved and most feared of all Japanese Monsters to ever stomp his way through Tokyo. The flaming atomic birthday candles had finally melted down, but were still smoking faintly as we walked to the Ginza subway station, tired, but happy to have been a part of the 56th Godzilla Birthday Celebration!